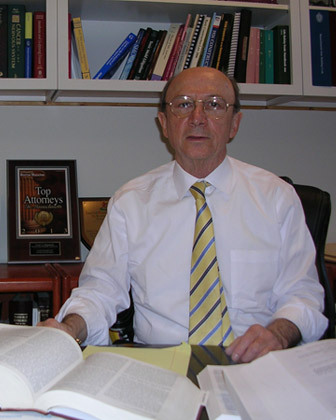 Extensive experience in civil litigation with emphasis in jury trial practice in the Federal and State Courts in the areas of torts resulting in personal injuries and wrongful death due to medical malpractice, defective products and drugs, construction site accidents, automobile accidents, slip & fall accidents, dog bites, and workers' compensation. Appellate practice before the Supreme Judicial Court and Appeals Court, including landmark case of Agis v. Howard Johnson Company, 371 Mass. 140 (1976), wherein the Court adopted theory of recovery for intentional infliction of emotional distress without the necessity of physical injury; and in the case of Delicata v. Bourlesses, 9 Mass. App. Ct. 713 (1980), where the Court set forth the standards to be applied in offers of proof before medical malpractice tribunals. Board Certified by the National Board of Trial Advocacy in the Specialty Area of Civil Trial Law. OSHA Certification in Construction Site Safety Training. Admitted to practice in Massachusetts, California and Florida. State Courts of Massachusetts, California and Florida. Federal Courts: United States District Court for the District of Massachusetts; United States Court of Appeals for the First Circuit; United States Supreme Court; United States Court of Federal Claims; United States District Court for the Central District of California. Repeatedly Selected For Super Lawyers® in Boston Magazine (Plaintiff’s Personal Injury). Former Special Assistant Attorney General for the Commonwealth of Massachusetts. Guest Speaker, Non-Physical Impact Tort Seminar, South Carolina Trial Lawyers Association. Panelist Speaker, Small Business Issues in Product Liability, Bentley College, Waltham, Massachusetts. Guest Speaker on "America Speaks" on Continental Cablevision on Topic of Medical Malpractice.